Most of us don’t want to kill our cousins. Most of us aren’t Queen of England. Mary Stuart, at the Shotgun Players in Berkeley, explores that situation. Elizabeth I, however, had a problem with her cousin, Mary Stuart, Queen of Scots. The problem being that they both wanted to be Queen of England, and both had a hereditary claim on the throne. So when Mary entered England, Elizabeth had her arrested and tried on charges of murdering her husband, and condemned to die. While the charges were true, they were really just a pretext to remove a rival. And yet, Elizabeth dithers. She wavers. She frets and stews, finally resorting to bureaucratic manipulation to get the job done and keep her hands as clean as Pontius Pilates. The story has another side–Mary’s life is hanging in the balance, yet when she manages an audience with Elizabeth, rather than beg for mercy and save her own life she lashes out and asserts herself, sealing her own doom. She is a Queen at heart, and cannot bow her head to another. There are side issues with former lovers and double crossers and palace intrigue and plotting, just to keep your mind busy. This play, written in 1799 by Friedrich Schiller, a German playwright, is a fictionalized recapping of real events, decidedly leaning towards Mary Stuart. It has been updated and adapted by Mark Jackson, who is also the director of the production. 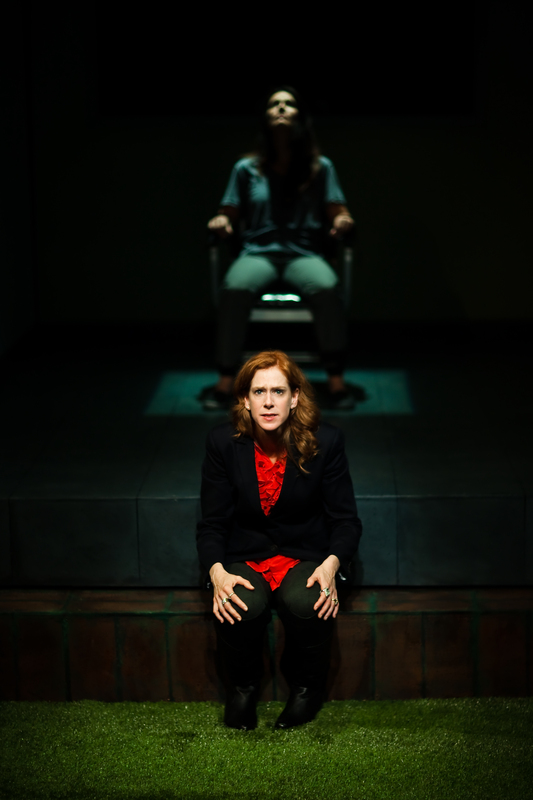 The play is now set in the present, on a stark and sterile stage representing a prison and various meeting rooms. There are a few references to modern events, tying the past to the present to indicate the universality of the situation (the line “we do not torture” plays very well in Berkeley). Shotgun Players is a small house; you buy your tickets in advance, but seats are assigned on a first-come basis starting an hour before showtime. Since we had dinner first, (at Locanda de Eva, in Berkeley) we ended up sitting in the very back row–but it’s a small house with steeply raked seating, and our seats were completely fine. The other fact of a small house; they can’t afford to pay many actors. Three of the actors were Equity members, the rest were not. Stephanie Gularte, Mary Stuart, is Equity. Beth Wilmurt, Elizabeth, isn’t. To an extent, it was like watching UCLA play the Pittsburg Steelers. Sometimes it seems like anyone could get on stage and pretend, and then you see the difference real talent and training make. Gularte was able to dominate the stage just sitting in silence, bound hand and foot to a chair. Mary Stuart was a great way to spend an evening. I learned some history, enjoyed the performance, even left $20 in the basket so that the theater can continue next season. Playing through November 7. I recommend it. Many years ago (can it have been 20?) I read Mary Queen of Scots by Antonia Fraser. Till then I had thought the British royalty pretty boring. This biography changed my mind. If the play piques your interest, try the book!